Photograph depicts (l-r) John Gower, Wayne Norton, and Bert Rogoway holding two trophies. Written on the verso: "2 cols Page 5. 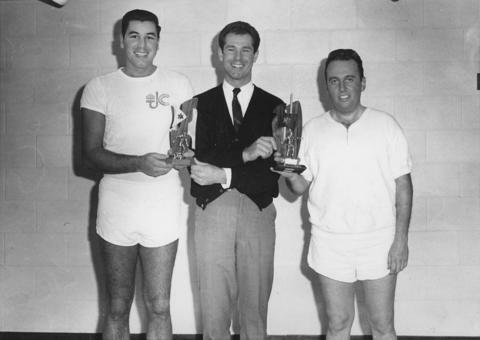 Left to right: John Gower, handball champion; Wayne Norton, gym director; Bert Rogoway, squash champion. A [J.] Seligman."